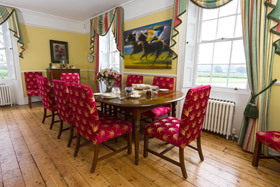 Huntingfield House is a luxury bed and breakfast, it is a Georgian fronted Manor house with rare mathmatical tiles. It is set in the North Downs of Kent on the edge of the beautiful village of Eastling, only 10 minutes drive from the market town of Faversham and sits in a designated area of outstanding natural beauty. The Grade II listed property dates back to the sixteenth century being the early home of Edward Hasted, historian of Kent and also former home to Lord Harris of The Belmont estate. The Park like grounds extend around the house giving it complete peace and privacy. 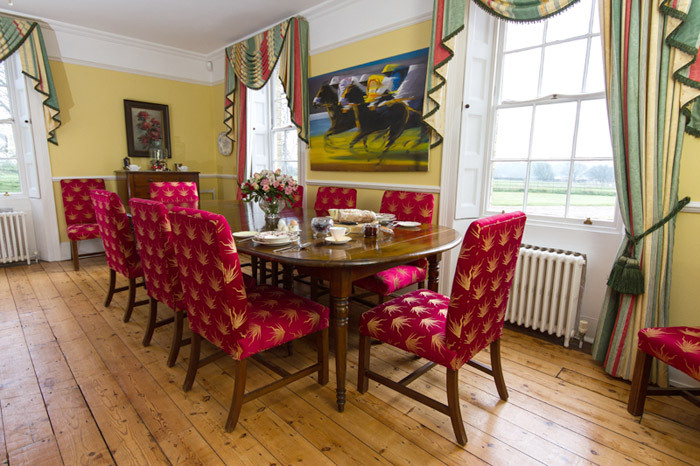 Whilst the house has been renovated to a high standard, it retains all the core features of a house of this period. 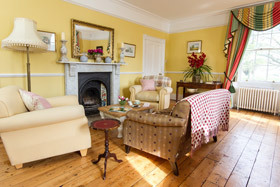 Huntingfield House provides an oasis of country elegance, calm and comfort. We have 2 lovely ensuite bedrooms and the family house is filled with lovely pictures and antiques. Our elegant Georgian dining room with its original features, truly magnificent sash windows and Marble fireplace is a lovely place in which to relax and soak up the atmosphere of the house. In the winter months you may like to toast your self in front of the fire. It is here whilst being served an Aga home-cooked breakfast, guests can again enjoy the unspoilt views across the garden and to the parkland beyond. Children are very welcome with travel cots and extra beds accommodated if needed. They are welcome to play in the garden and if they like collect the eggs from our chickens. Huntingfield House has complimentary wireless internet, and is available for use throughout your stay with us. Ideal for anyone seeking a secluded place to stay, Huntingfield House also appeals to those walking the North Downs, Pilgrims Way and Greensand Way - all of which are nearby. OS maps of the area are available to you as well as our local knowledge. We are happy to provide picnics on request. Whitstable and Canterbury are 30 minutes away. We are Only 30 minutes drive from the Eurostar Terminal at Ashford, Kent for the Continent, 45 drive minutes from Gatwick Airport, 40 minutes drive from Dover and Folkestone Channel Ports and only 1 hour from London. This makes Huntingfield House the ideal location for all your sightseeing in the county of Kent and the South East of England. Visit Huntingfield House, whether it is for a, holiday, business trip or to find the perfect weekend getaway for a romantic break or to see the many historic houses and tourist attractions. We can provide a three course evening meal for £30 pp or a light 2 course supper for £15 pp . We are happy to cater for any dietary requirements.